I have to admit, I am not only feeling a bit in a slump with writing for this week/past week, but feeling just slight discouragement at not getting any readers yet. But, mind you, this is slight. I have no intentions of giving up that easy. I always have been and always will be the fighter. 😉 I am not looking for a huge amount of readers. I am only hoping for a few steady ones, people to just share this journey with. After all, no one wants to feel alone on those journeys, especially the tough ones. I wish to grow this blog and the entire site, but I want it to be shaped by not just me, but readers. I want it to be a slightly cooperative growth. I feel like input will make it evolve so much better than I could do it alone. It seemed like an interesting experiment AND growth opportunity. But I sheepishly admit, I am not the best at networking with people, and I am only just learning how to come out of my shell. It has been a shell I definitely needed over the past few years though, not only to evolve how I have needed, but to guard myself and heal…which I also really needed. So, again, mind you, this is all a new process to me. Working with technology is not new, and neither is exploring the internet, or even working with graphics. I have done much involving those for nearly 20 years. But using all of this to actually reach out and connect with others, is very new. So forgive my process, and mostly my stumblings. Anyway, I am of the mindset, “if you build it, they will come.” So, I will keep building. Now its important to note, this process is for me, and even if I get little to no readers, I will be sad at that, but I will continue to do this. Any readers, and any gentle guidance on my process will be very welcomed, but will not stop me from going forward. As a good friend of mine loves to say, “just keep shuffling your feet and life can’t bury you.” On that note, and my effort to continue building, I offer up something today to perhaps entice some to come in, and sit awhile, and just join me. I cannot buy you, the reader, a cup of tea, and say sit and chat with me, but perhaps you can use something I created this week. I started out making it just for me, mind you. 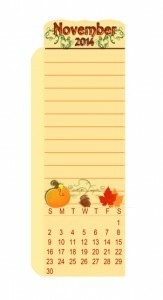 A November Page Marker/Bookmark. As I noted in my first post, I love to journal, and I love planners. I am trying to find a way, in my life, to blend the two nicely for me. I want my planner to eventually be the perfect combination of daily life journaling, and organization, and planning/scheduling. Some people have created lovely today/page markers, some have created wonderful bookmarks, some have made really interesting inserts etc. But I have found it tough to find at times, just what I am looking for. I wanted a today/page marker, but I also wanted a place to jot a few notes, or perhaps just noteworthy reminders for the month. I also wanted it to have a calendar. So, rather than pull out a few more hairs trying to search out exactly what I wanted, I came up with today’s offering. This is for November, but if you like it, I will continue to do one for each month, and I am even hoping for input on how I can improve this, and tweak it to something even better. Like all things I will present on this blog, I am looking to evolve this creation with a little bit of user input. So, let’s create together, hah? A couple notes: this marker’s dimensions are, without the tab on the top; 3 by 8.5. The tab adds about an inch or so to stick out of your planner or journal or album or whatever you like. I put the marker on an image size of about 6 by 11. This seems to be closest for those, like me, who have a planner that is 5.5 by 8.5 or roughly A5 size. But you can resize it to fit whatever planner or album etc. that you like. I just wanted to make sure the detail would be crisp enough for larger sizes as well. I also added an area on the left side that is intended to be the space where you would punch your holes. This was approximately a half an inch of space, but of course trim that area to how you like it. I am not at home, and not near a color printer, so I cannot test it. So therefore, I welcome even more feedback as to how it comes out. I will be doing better testing when I am home. I am hoping the color comes out as I intended it. I might print out a black and white copy at my friend’s house, or go to staples or something to print a color copy. I want to be able to put it in my planner, and show you how I use it, but if anyone does use, and wants to share an image, I would be happy to post that here, or on my pinterest board. A couple of ideas for you. You might try printing it and then having it laminated, and then you can write on it and then wipe off as you complete tasks or whatever you use it for. I can even make a more perpetual one for this very purpose, if there is enough interest. This would work nicely in any size planner, providing you adjust the size output, it could work nice in any journal, whether punched or just cut to slide into the pages. This could work nicely in a Project Life album, it could work in a scrapbook. This could even be used in a reading book. Use your imagination. But I would love to see how you use it. I will be doing lots of things for planners and journals etc. I want to think of lots of new and interesting things to make for them. Input from you would help me evolve it into something truly useful for any of us. So please let me know what you think. I love printables, and of course like many, my pinterest boards are loaded with them, and I hoard every printable on my computer that I can find. =) So, I hope you enjoy this and I look forward to creating more, and also looking forward to evolving those creations with others feedback. As usual with anything I offer here, this is for your personal use only. You are welcome to share this with people you know, especially on socia media, as long as there is a link back to this site, and do not direct link to the image please. Link to this page where they can then download. I hope you enjoy this page/today marker/bookmark, and let me know what you like about it, what you would like to see added, etc.